Last year we made a project similar to this one with an assortment of beads and buttons. This year, we are adding a few more mosaic pieces and stylish buttons to our Big Ideas project to turn it into a beautiful art display! 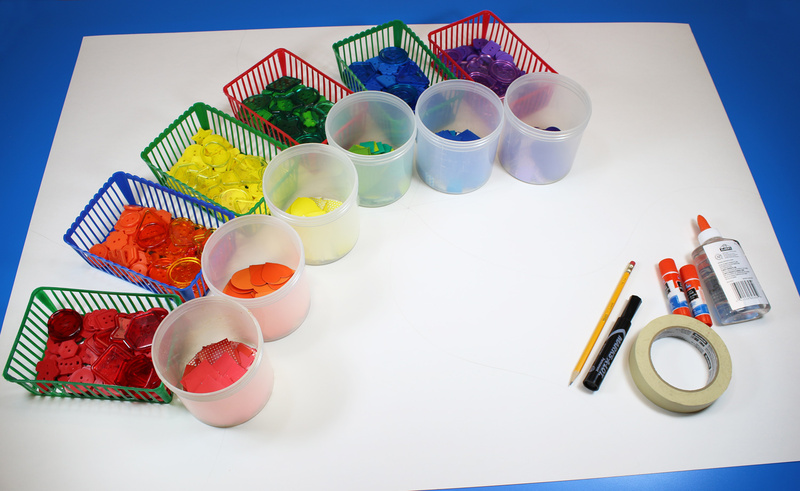 Learning Objectives: Use multiple materials to create one solid artistic masterpiece. A great group activity that requires students to work together to fit materials into the appropriate blank spots on the drawing. Talk about the different colors in the artwork. Sort the materials into groups by similar colors. Incorporate patterning within the mosaic artwork. This project can be done over a period of several days or within a single art class. It all depends on the scope of your project. Every student can contribute to the art project or you can separate your classroom into groups of 4 or 5 and get each student to work on their own section in the mosaic artwork. In the animation above, you can see how all of the pieces come together. We separated the giant sheet into six sections. Each section is represented by a specific color. Sort the mosaics and buttons into similarly colored groups, then begin gluing down all the pieces. Rotate the different pieces to glue them down in the appropriate spots. Continue through the entire section and make sure that the buttons and mosaics are snugly fit together. At the end, you get an amazing blend of materials to make a glorious masterpiece! This entry was posted in Big Ideas, New and tagged bright buttons, bristol board crafts, buttons, mosaic button illustration, mosaic project, mosaics, petit pattern mosaics, poster board crafts, really big buttons, see-through buttons, spectrum mosaics by roylcoblog. Bookmark the permalink.